Following Scripts Helps in Creation of Virtual Machines Across Specified Hyper-V Hosts, The Workflow Function Input can be given using a csv file. The CSV File consists of all parameters Like VM Name, Computer Name, Startup Memory, Vhd Location Type etc. # Specify the Name of Hyper-V Host on which VM Needs to be Created, localhost has been specified as default. Write-Progress -Activity "Waiting for $vmname to Aquire an IPAddress"
Write-Progress -Activity "Waiting for VM to Aquire an IPAddress"
Write-Output "VM Does Not need To be Joined to Domain"
# Notice that now it is joined to domain! 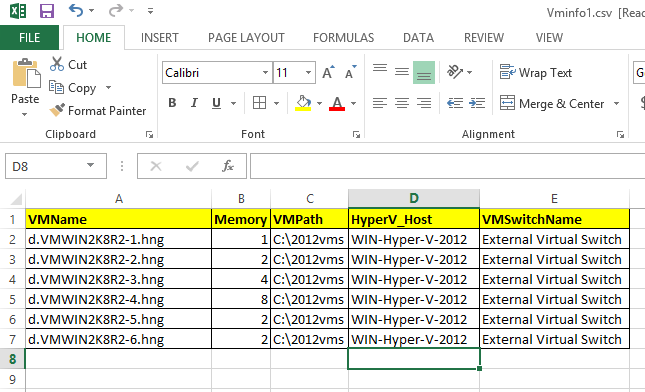 Here is the Content of VMInfo1.csv. Here you are using one sysprepped VHD for all VMs. DOnt you think this will create mess when we will join these machines into domain?